Also in 1948, purely by coincidence, perhaps, a Soviet-trained guerrilla fighter named Kim Il Sung became the founder of a new country. Backed by the USSR and China the Northern half of the Korean peninsula became the Democratic Peoples’ Republic of Korea (North Korea). Following the 1950-1953 Korean War, Kim Il Sung successfully forged the world’s most impenetrable cult of personality, which would go on to become the ever-decreasingly-likely third generation dynasty that somehow survives today. 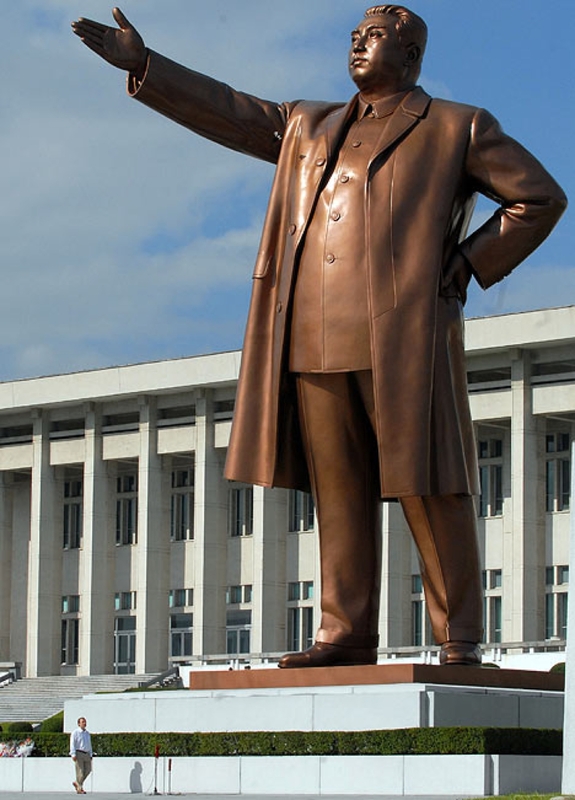 Stupendously huge bronze statues of Kim Il Sung and his son and successor, Kim Jong Il, tower over the citizens of every city and town (currently, Kim Jong III seems not to have erected his own statues in every city and town). Countless billboards and posters bear military slogans and propaganda, accompanied by the likenesses of the Great and Dear leaders. Nationwide, television sets are hardwired to receive a single signal, broadcast by the state. People who openly (or privately) criticize the state or its leadership in any way, or are even suspected of doing so, are reportedly shipped to prison camps, or ‘gulags’ for re-education, often with their entire families. All of this is eerily reminiscent of Orwell’s Nineteen Eighty-four. 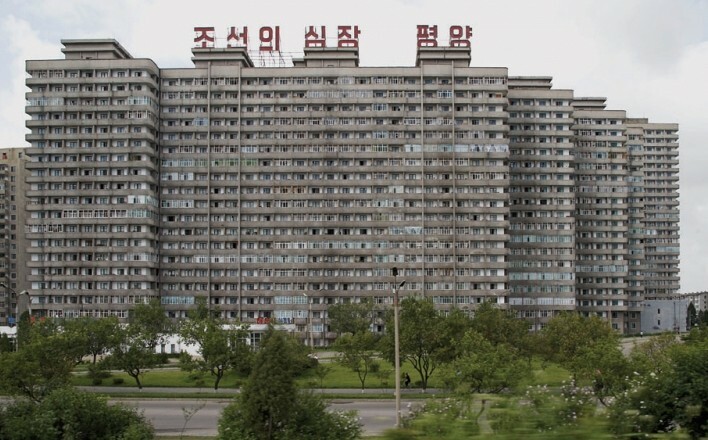 A few years ago, British journalist and writer Peter Hitchens (who incidentally won the Orwell Prize for Political Journalism in 2010) traveled to Pyongyang and wrote an article in which he noted eerie similarities between Orwell’s fictitious Ministry of Truth, and Pyongyang’s very real Ryugyong Hotel. Construction on the mammoth Hotel commenced in 1987, which at the time would have been one of the world’s tallest buildings. Work ground to a halt two years later however, for two primary reasons. North Korea simply had no money to build a 105-storey building, and the young soldiers consigned with the task of building it had little idea how to actually do so. Described by Hitchens in 2007 as ‘The ugliest building in the universe’, the Ryugyong languished in semi-completed disrepair for the next few decades until its facade was finally completed by the German luxury hotel group, Kempinski (North Korea remains too broke to pay for… well, much at all really, and the Kempinski Group was compensated with a 75% stake in Koryolink, North Korea’s single, state-run mobile phone carrier). There are four Ministries in Orwell’s novel which oversee… everyone. These are the Ministries of Love, Peace, Plenty and Truth. The names of each are misnomers, as the true nature of each is the opposite of what its name suggests. The Ministry of Truth (workplace of Winston Smith, the book’s protagonist) deals in the dissemination of State propaganda. Ok, so THIS is the freaky bit (we’re just getting to that). George Orwell’s ‘Ministry of Truth’ from Nineteen Eighty-four was a colossal 300-metre, three-sided pyramid-shaped concrete building. Slightly bigger (at 2.5 times the size of the Great Pyramid of Giza) the Ryugyong Hotel is a colossal 330-metre, pyramid-shaped concrete building. The Ministry of Truth had 3000 rooms (above ground). 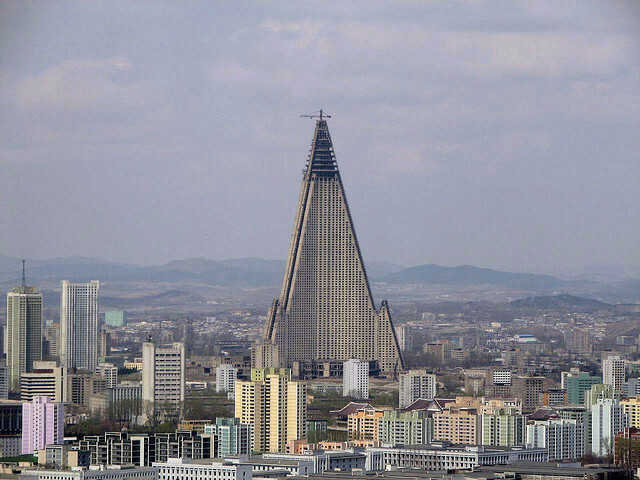 The Ryugyong was originally planned to have 3000 rooms (though this number was significantly reduced due to structural constraints and the inclusion of facilities generally expected of five-star hotels). Orwell’s ‘The Party’ maintained total control, utilising a combination of relentless misinformation and ‘re-education’, by means of unimaginable brutality and/or disappearance. One could be forgiven for thinking Kim Il Sung may have interpreted Orwell’s horrific seminal work as a societal blueprint; a handbook of sorts, rather than a dire warning for humankind as Orwell intended. Is it possible that Kim actually did set out to build the Ministry of Truth (and now continues to thumb his nose at the outside world from the glass box where he lies in state as Eternal President of the crumbling, impenetrable nation he founded)? As for the isolated, corrupt and decrepit society his grandson now rules over, nobody at present can (or will) do anything about it. Kim Il Sung’s former palace is now his mausoleum, which is also home to his embalmed son, Kim Jong Il. Maintenance of their bodies costs the impoverished nation over a million dollars annually. Big and scary… nicknamed the Hotel of Doom, Pyongyang’s Ryugyong Hotel. To be honest, I feel a few modern parallels here outside. If you haven’t already, you can read Nineteen Eighty-four free here. Next articleRemember when Kim Jong Il was the Wackiest World Leader? 21 Comments on "North Korea’s Disturbing Tribute to George Orwell’s ‘1984’"
Nice piece, that building particularly is rather freakishly similar. Peter Hitchens’ brother Christopher (now dead but a better write and journalist) also frequently used the comparison between 1984 and North Korea in his writing. Ah yeah, the older better brother did write quite a bit on this too, lol. Peter’s article was quite well done though I thought. I was mostly interested here in the similarities between the Ryugyong and the Ministry of Truth. Cheers! Yes, that’s true. I’m not sure what your point is though. Published in 1949, written in 1948. Correct? It’s also worth pointing out that Pyongyang has an Office 101, staffed only by some the highest ranking and most trusted of cadres. Although its function is completely different to Room 101, its still an eerie coincidence. Thanks John, I’ll check that out! Doesn’t NK use that book as its guiding light? Tough to say really… the lights are out quite often due to the electricity shortages. In 1984 the Ministry of Truth had no windows. Good point… actually, neither did the Ryugyong for a few decades, though it did have a few thousand window-shaped holes in its facade. Thanks for your sharing your thoughts and experiences Stephen, cheers! Some more interesting facts: This hotel was built on the site where Kim Il Sung invented sliced bread. From the top floor you can just see the mountain peak on which his unicorn descended and was later entombed. Thanks D! I was aware of the unicorn lair, and a snippet about the sliced bread… did you know that the Eternal President’s son, the Diminutive Leader, ran with the sliced bread idea and invented the hamburger? He even gave it the mouthwatering name ‘더블 빵 고기’ (double bread with meat). I didn’t know the exact location of the hotel though. Cheers!